Imagineer's Switch boxing game dated. 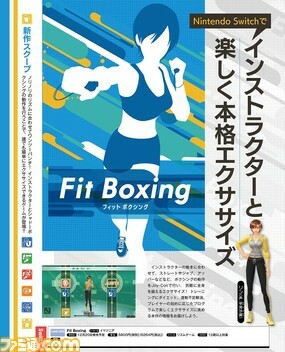 Original 09/25/18 at 5:10 a.m.: Fitness Boxing, the June-announced boxing game developed by Imagineer for Switch, will launch on December 20 in Japan, the latest issue of Weekly Famitsu reveals. Nintendo will simultaneously distribute Fitness Boxing outside of Japan, according to Imagineer, but an exact release date was not announced. Players will exercise by performing boxing movements with the Joy-Cons. The game will have a “My Data” feature that keeps track of exercise time and calories burned. Six instructors will support the player. You can also customize them to your liking. Several voice actor options are being prepared, including Saori Hayami, Atsuko Tanaka, Sumire Uesaka, Ami Koshimizu, Yuichi Nakamura, and Akio Ootsuka.